AKI is one of the serious postoperative complications of OPCABG. Such AKI may affect long-term kidney function, may increase hospital stay, adds extra financial burden to the patients and increase overall morbidity and mortality. We administer intravenous fluids (IVFs) routinely in the perioperative setting. Some of the IVFs such as normal saline, hydroxyethyl starch (130/0.4) in 0.9% normal saline (Voluven) have higher chloride content which may cause hyperchloremic metabolic acidosis. Hyperchloremic metabolic acidosis may cause renal vasoconstriction and decrease in glomerular filtration which may lead to renal dysfunction. Recent studies,, review articles, and meta-analysis have shown the use of chloride-restricted IVFs has been associated with reduced risk of renal dysfunction in surgical and critically ill patients. Above findings suggest perioperative IVF choice could be an important consideration for better preservation of postoperative renal function. After approval of Institutional Ethics Committee, study was undertaken on total 600 patients. Written informed consent was obtained from all patients. In study Group A (n = 300) chloride-rich IVFs such as hydroxyethyl starch (130/0.4) in 0.9% normal saline (Voluven - Fresenius Kabi, Deutschland GmbH, Germany) and 0.9% normal saline (Claris Otsuka Private Limited, Village-Vasana-Chacharwadi, Tal-Sanand, Ahmedabad, India) and ringer lactate (Claris Otsuka Private Limited, Village-Vasana-Chacharwadi, Tal-Sanad, Ahmedabad, India) were used for perioperative fluid management. In Group B (n = 300) chloride restrictive IVFs such as hydroxyethyl starch (130/0.4) in balanced salt solution (Volulyte - Fresenius Kabi, Deutschland GmbH, Germany) and balanced salt crystalloids (PlasmaLyte A, Baxter private limited, Gurgaon, India) were used for perioperative fluid management. Adult patients of either gender aged between 40 and 70 years with estimated glomerular filtration rate (eGFR) of more than 60 mL/min/1.73 m2, patients with triple vessel coronary heart disease, and the American Society of Anesthesiologist – II - III physical status were included in the surgery. Patients with serum creatinine higher than 1.20 mg/dl in males and higher than 0.8 in females, emergency surgery, preoperative resting hypoxia (room air oxygen saturation [SpO2] <90%), preoperative mechanical ventilation, body mass index (BMI) <18 or >30, age <40 or >70 years, ejection fraction < 45%, comorbid disease other than hypertension (HTN) and diabetes mellitus (DM), cardiovascular instability requiring cardiac support to maintain hemodynamic parameters within 20% of baseline perioperatively, intraoperative or postoperative respiratory dysfunction leading to partial pressure of carbon dioxide (PaCO2) >45 mmg or requiring noninvasive ventilation, not able to maintaine intraoperative or postoperative haemodynamic parameters within 20% of baseline, intraoperative or postoperative demise of patient due to other than renal function deterioration, preexisting known kidney disease or previous nephrectomy or previous renal transplantation were excluded from the study. Sample size was calculated with two-tailed distribution. A total of 180 cases in each arm were required for effect size of 0.3 level of significance at 5%, power of 80%, and allocation ratio of 1:1. In our study, we had taken 300 patients in each arm. The sample size calculation was derived using software G* power 3.1.9.2. Continuous variables were assessed for the normality using Shapiro–Wilk test. If the variables were normally distributed, they were expressed as mean ± standard deviation otherwise median (interquartile range). All the categorical variables were expressed either percentage or proportion. Comparison of all the normally distributed variables was done by t-test or ANOVA. Comparison of all the non-normally distributed continuous variables was done by Mann–Whitney U-test or Kruskal–Wallis H test. Categorical comparisons were done by either Chi-square test or Fisher's exact test based on number of observations. Data analysis was carried out by Windows SPSS ver. 16.0. All P < 0.05 was considered as statistically significant. All the patients were subjected to thorough preanesthetic check-up and written informed consent was taken from all patients. All the patients were premedicated with intramuscular morphine 0.1 mg/kg and promethazine 0.25 mg/kg. Under local anesthesia, 16G wide bore intravenous (IV) cannula and arterial line were inserted. General anesthesia induced with IV thiopental 5 mg/kg, IV fentanyl 5μg/kg and 50% nitrous oxide, and 1% sevoflurane in oxygen. Tracheal intubation was facilitated by IV rocuronium1 mg/kg. After induction, all patients were secured with central venous line. Anesthesia was maintained with nitrous oxide and sevoflurane in oxygen, IV fentanyl infusion 2μg/kg/h, IV propofol infusion 1 mg/kg/h and muscle paralysis with IV rocuronium infusion 6μg/kg/min. Supplemental doses of IV midazolam 2.5 mg boluses were given accordingly. OPCABG was performed with median sternotomy and cardiac stabilization using myocardial stabilizer (Octopus II). 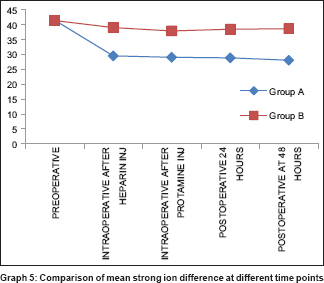 IV heparin 2 mg/kg (100U = 1 mg) given at the beginning of graft harvesting and activated clotting time was maintained around 350s throughout the surgical procedure. After completion of anastomosis of all coronary grafts, heparin was reversed with IV protamine 1 mg for 1 mg of heparin by IV infusion. After the procedure, all patients were shifted to cardiothoracic intensive care unit for the further care and monitoring. Monitoring consists of heart rate, invasive arterial pressure, SpO2, 5 lead electrocardiogram, end-tidal carbon dioxide, central venous pressure, temperature, minimum alveolar concentration and end-tidal concentration of anesthetic gases, blood loss, and urine output. With above monitoring, hemodynamic parameters were maintained within 20% of baseline by titration of vasoactive drugs such as nitroglycerin adrenaline, dobutamine, and noradrenaline infusion. There were brief periods of hypotension during positioning of the heart for grafting, which were reversed after repositioning of heart. Arterial blood gas analysis was done preoperatively 1 day before surgery, twice intraoperatively one after heparin injection as an anticoagulant agent in the beginning of surgery, and one after protamine injection for heparin reversal after the surgical procedure was over and postoperatively every 4th hourly as per hospital protocol. 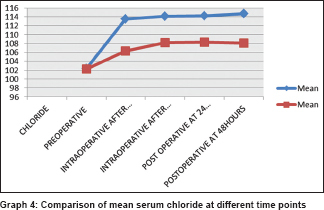 Serum creatinine concentration was determined at 24 h and 48 h postoperatively. All patients were electively ventilated 6–12 h postoperatively. They were extubated after they met extubation criteria. All the patients were given supplemental oxygen postoperatively through Hudson face mask. 186 × (serum creatinine/88.4)–1.154 × (age)–0.203 × (0.742 if female). We have taken serum creatinine values preoperatively, postoperatively at 24 h, and at 48 h of surgery. 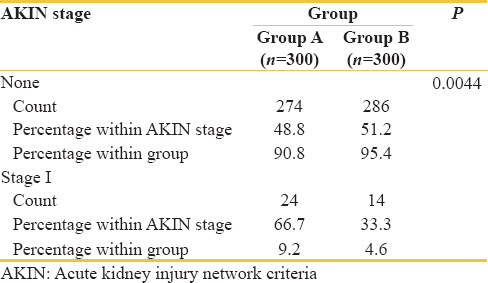 Perioperative change in kidney function assessed by acute kidney injury network (AKIN) criteria and compared between the study groups. Stage 1 – increase creatinine 1.5 times from baseline or increase of >0.3 mg/dl within 48 h. Stage 2 – increase creatinine 2 times from baseline. Stage 3 – increase in creatinine 3 times from baseline or creatinine >4 mg/dl with an acute increase >0.5 mg/dl within 48 h or new-onset renal replacement therapy. We did not consider urine output as it may alter with use of diuretics. Decrease in SID below 40 indicates acidosis. Perioperative changes in pH, PaCO2, HCO3, base excess (BE), Na+, K+, lactate, and SID were compared between the study groups. Study groups were comparable in terms of sample size, age, gender, BMI [Table 1], and comorbidities (HTN and DM) [Table 2]. 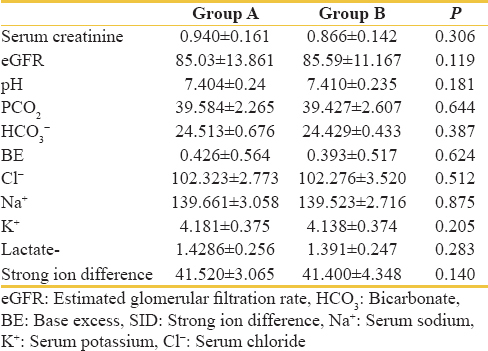 Study groups were comparable preoperatively with respect to serum creatinine, eGFR, pH, PCO2, HCO3, BE, Cl−, Na+, K+, lactate, and SID [Table 3]. The mean postoperative serum creatinine in Group A at 24 h was 1.093 and in Group B at 24 h was 0.846 with a P = 0.004. Moreover, the mean postoperative serum creatinine in Group A at 48 h was 0.974 and in Group B at 48 h was 0.832 with a P = 0.032 [Table 4]. Moreover, there was statistically significant difference in postoperative serum creatinine at all-time points (P < 0.05). In Group A, 9.2% patients and Group B 4.6% patients developed Stage-I AKI determined by AKIN criteria which were statistically significant (P < 0.05). No patients had Stage II or III AKI postoperatively [Table 5]. No patients were on renal replacement therapy during study period. 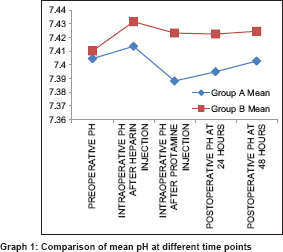 In Group A, intraoperative and postoperative ABGs showed statistically significant difference in pH [Graph 1], HCO3 [Graph 2], BE, Cl−, and SID in all time points (P < 0.05). Mean base excess [Graph 3], mean serum chloride [Graph 4] and mean serum SID [Graph 5] in Group A in comparison to Group B and there was no statistically significant difference in PCO2, Na+, K+, and lactate (P > 0.05) thus proving that Group A had significant hyperchloremic acidosis. Our present study shows, perioperatively use of chloride-restricted IVFs was associated with statistically significant lower incidence AKI Stage - I postoperatively. Use of chloride liberal IVFs perioperatively was associated with hyperchloremic acidosis and increased incidence of AKI Stage-I postoperative AKI. None of the patients in the study groups developed AKI Stage II or Stage III. Our study indicates that IVFs chloride content can affect renal function after OPCABG. Like our study, previous studies also have found a significant association between hyperchloremic acidosis and AKI with the use of chloride liberal IVFs compared to chloride restricted IVFs. In 2015, article by Kim et al. 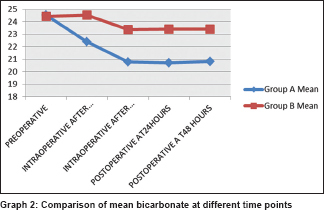 reveal that the incidence of severe AKI and persistent AKI after OPCAB were significantly lower and the postoperative extubation time and duration of hospital stay were significantly shorter with the use of balanced solutions. In 2015 Yunos et al. found that liberal chloride therapy remains associated with a greater risk of kidney disease. In 2014, review article by Lobo and Awad argue that chloride-rich crystalloids such as 0.9% saline should be replaced with balanced crystalloids as the mainstay of fluid resuscitation to prevent “prerenal” acute kidney injury (AKI). In 2011, Meyera in their study found that the Cl- level was lower (P < 0.05 at the end of surgery), and arterial pH was higher in the balanced group at all-time points except baseline, and BE was less negative at all-time points after baseline (P < 0.01). McCluskey et al., in 2013, Shaw et al., in 2014 and Young JB et al., in 2012 found that increased morbidity and mortality after noncardiac surgery was independently associated with hyperchloremia.,, These findings strongly support the notion that perioperative use of chloride-restricted IVFs is associated with a decreased incidence of postoperative AKI. Another pertinent result of our present study was development of statistically significant hyperchloremic metabolic acidosis, which can be avoided using chloride-restricted IVFs. These finding were in accordance with previous studies, that is development of hyperchloremic metabolic acidosis after administration of chloride liberal fluids. Our study has several limitations. The sample size was small despite a sufficient number of subjects as per result of power of analysis. Only patents with eGFR >60 ml/min/1.73 m2 were considered. Simple SID was calculated using only Na+, K+, and Cl− values. OPCABG surgery per se is a major surgery involves various derangements and many factors can alter acid-base status. We did not consider volume of perioperative IVF administered, perioperative blood loss and perioperative volume of blood products administered. 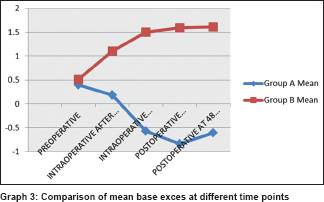 Study period was limited up to postoperative 48 h only. Furthermore, few previously published studies did not show a significant association between hyperchloremic acidosis and AKI with the use of chloride liberal IVFs compared to chloride restricted IVFs. In meta-analysis published in 2015 by Krajewski et al. found that there is only weak association with higher chloride content and unfavorable outcomes, but mortality was unaffected by chloride content. Guidet et al., in 2010, in their extensive review on balanced solutions say that, hyperchloremic acidosis is a moderate and relatively transient side effect, minimized or avoided by limiting chloride liberal IVF administration. In 1994, McFarlane and Lee compared plasmalyte 148 versus saline 0.9% for intraoperative fluid replacement on 30 patients undergoing major hepatobiliary or pancreatic surgery, those receiving saline had significantly increased chloride concentrations, decreased HCO3 concentrations, and increased base deficit compared with those receiving Plasma-Lyte, there were no significant changes in plasma sodium, potassium, or lactate concentrations in either group. They concluded that the exclusive use of 0.9% saline intraoperatively produced a temporary hyperchloremic acidosis and use of a balanced salt solution such as Plasma-Lyte148 may avoid this complication. Accordingly, our present results should be interpreted with caution, and further randomized larger multicenter trials are needed. From our study, we conclude that hyperchloremic acidosis developed after infusion of chloride liberal IVFs was found to be detrimental to kidney function postoperatively. The authors would like to thank all the patients who participated in the study and also all the staff of the Department of Anaesthesia for their support during the study. Puskas JD, Williams WH, Mahoney EM, Huber PR, Block PC, Duke PG, et al. Off-pump vs conventional coronary artery bypass grafting: Early and 1-year graft patency, cost, and quality-of-life outcomes: A randomized trial. JAMA 2004;291:1841-9. Afilalo J, Rasti M, Ohayon SM, Shimony A, Eisenberg MJ. Off-pump vs. On-pump coronary artery bypass surgery: An updated meta-analysis and meta-regression of randomized trials. Eur Heart J 2012;33:1257-67. Puskas JD, Williams WH, Duke PG, Staples JR, Glas KE, Marshall JJ, et al. Off-pump coronary artery bypass grafting provides complete revascularization with reduced myocardial injury, transfusion requirements, and length of stay: A prospective randomized comparison of two hundred unselected patients undergoing off-pump versus conventional coronary artery bypass grafting. J Thorac Cardiovasc Surg 2003;125:797-808. Garg AX, Devereaux PJ, Yusuf S, Cuerden MS, Parikh CR, Coca SG, et al. Kidney function after off-pump or on-pump coronary artery bypass graft surgery: A randomized clinical trial. JAMA 2014;311:2191-8. Olsson D, Sartipy U, Braunschweig F, Holzmann MJ. Acute kidney injury following coronary artery bypass surgery and long-term risk of heart failure. Circ Heart Fail 2013;6:83-90. Severs D, Hoorn EJ, Rookmaaker MB. A critical appraisal of intravenous fluids: From the physiological basis to clinical evidence. Nephrol Dial Transplant 2015;30:178-87. Chowdhury AH, Cox EF, Francis ST, Lobo DN. A randomized, controlled, double-blind crossover study on the effects of 2-L infusions of 0.9% saline and plasma-lyte® 148 on renal blood flow velocity and renal cortical tissue perfusion in healthy volunteers. Ann Surg 2012;256:18-24. Lobo DN, Awad S. Should chloride-rich crystalloids remain the mainstay of fluid resuscitation to prevent 'pre-renal' acute kidney injury? Con. Kidney Int 2014;86:1096-105. Chowdhury AH, Cox EF, Francis ST, Lobo DN. A randomized, controlled, double-blind crossover study on the effects of 1-L infusions of 6% hydroxyethyl starch suspended in 0.9% saline (voluven) and a balanced solution (Plasma volume redibag) on blood volume, renal blood flow velocity, and renal cortical tissue perfusion in healthy volunteers. Ann Surg 2014;259:881-7. Yunos NM, Bellomo R, Hegarty C, Story D, Ho L, Bailey M, et al. Association between a chloride-liberal vs chloride-restrictive intravenous fluid administration strategy and kidney injury in critically ill adults. JAMA 2012;308:1566-72. Meyera E. A review of renal protection strategies. South Afr J Anaesth Analg 2015;21:27-30. Krajewski ML, Raghunathan K, Paluszkiewicz SM, Schermer CR, Shaw AD. Meta-analysis of high- versus low-chloride content in perioperative and critical care fluid resuscitation. Br J Surg 2015;102:24-36. Greenbaum J, Nirmalan M. Acid-base balance: Stewart's physiochemical approach. Curr Anaesth Crit Care 2005;16:133-5. Kim JY, Joung KW, Kim KM, Kim MJ, Kim JB, Jung SH, et al. Relationship between a perioperative intravenous fluid administration strategy and acute kidney injury following off-pump coronary artery bypass surgery: An observational study. Crit Care 2015;19:350. McCluskey SA, Karkouti K, Wijeysundera D, Minkovich L, Tait G, Beattie WS, et al. Hyperchloremia after noncardiac surgery is independently associated with increased morbidity and mortality: A propensity-matched cohort study. Anesth Analg 2013;117:412-21. Young JB, Utter GH, Schermer CR, Galante JM, Phan HH, Yang Y, et al. Saline versus plasma-lyte A in initial resuscitation of trauma patients: A randomized trial. Ann Surg 2014;259:255-62. McFarlane C, Lee A. A comparison of plasmalyte 148 and 0.9% saline for intra-operative fluid replacement. Anaesthesia 1994;49:779-81.